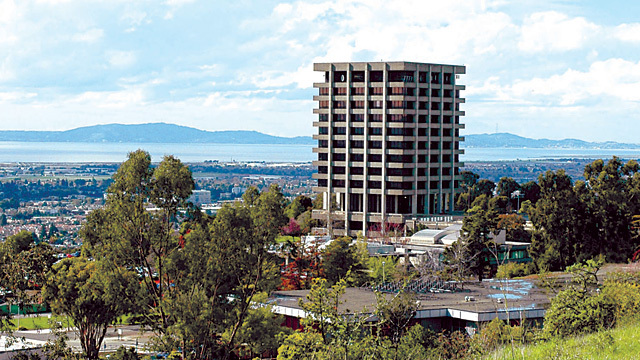 Scientists with the U.S. Geological Survey are looking for volunteers in the East Bay to help document a powerful seismic event in mid-August, when a 13-story building on the California State University, East Bay campus will come crashing down, making way for a new, seismically stable replacement. The implosion of Warren Hall will mimic the energy of a 2.0-2.5 magnitude earthquake, giving geologists a unique chance to study what happens below the surface. To measure the seismic waves, USGS is looking for volunteers in Hayward and the East Bay to help deploy a network of seismographs. Over the next month, they’ll be knocking on doors around campus, asking local residents to host the seismic instruments in their yards. Volunteers can sign up online. The data should reveal what the geologic layers around the Hayward Fault are made of, indicating how violently the area would shake during a major earthquake. Geologists will also be looking for splays, or secondary faults, off the main fault. “A fault is not just one break in the ground,” he said. “It’s a zone of breaks and it’s difficult to tell just how wide that zone is. The data could provide a clearer picture of the damage a major earthquake would do. There’s a 63 percent chance of a major quake in the Bay Area over the next 20 years.